This is a new model for me, Built on the same mould as my ' Soloist ' model, but with a slighty larger upper bout, the back length is much the same at 43" , and with a 41" stop. The back, sides and head are of English sycamore of light figure, the front table is moderate grained Apine spruce, widening out at the flanks, with beautiful medullary rays. The instrument is covered in a golden oil varnish Would suit advanced student heading to music college, would also make a good jazz bass. Very moderatly priced, email for details. This bass is now sold. 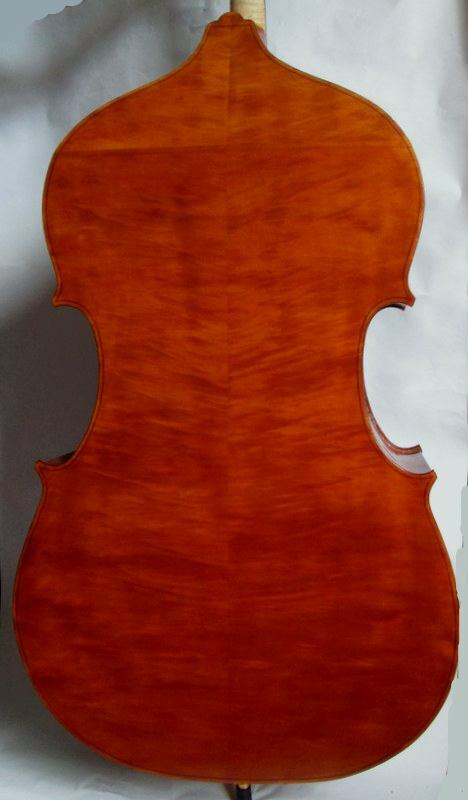 This is my latest 'Soloist' model double bass, no. 122 and also probably the last, so if you want one, get it now. The back is of English poplar, the sides and neck are of lightly figured sycamore, The front is a lovely piece of Sitka spruce cut some 30 plus years ago. 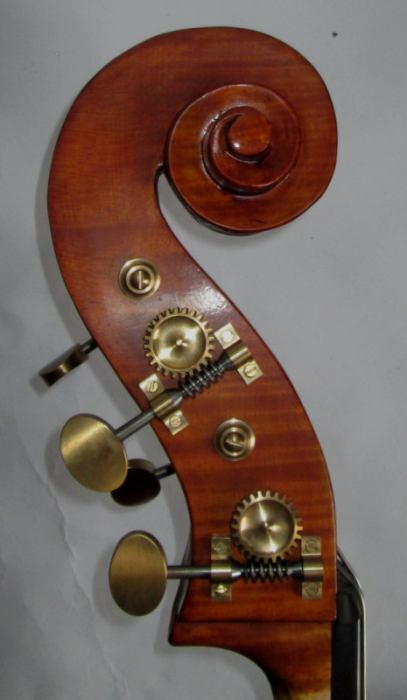 Length of back 43ins, string stop 40.5 the instrument is covered in a golden brown oil varnish, the bass is fitted with Spirocore strings. This bass is now sold. This model has, over the years, been my most popular double bass, and many have been made using both sycamore, and poplar for the backs. This model has back, sides and head from figured English sycamore, and a front of Sitka spruce, cut some 30 plus years ago, the instrument is covered in a golden brown oil varnish. Length of back 43ins, string stop 40.5ins. This bass is now sold. Following the Thomas Kennedy model, this is one of my less expensive basses, (are any of my basses expensive). 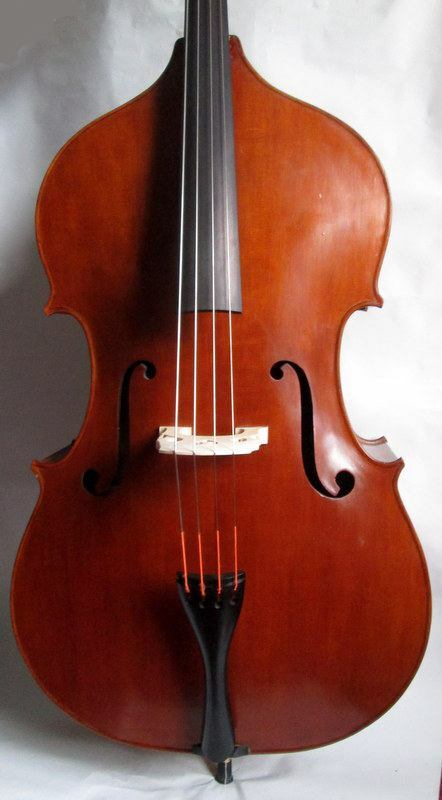 An ideal student instrument, this would take you right into the profession, or good acoustic jazz bass. Made with plain maple sides, a back of English poplar, and a front of open grained Sitka spruce, a great bass for a reasonably modest outlay. Length of back 44.5", 113cm, width of upper bouts 21.5" 55cm, bottom bouts 26.5" 67cm, depth of ribs 8.5" 22cm, string stop 41.25" 104.5cm. One of the very last of my bigger 4 string orchestral basses, fitted with Spirocore strings, email for price or to come and try it. This bass is now sold.